French Christian Orientalist; born at Paris about 1670; died at Oxford March 2, 1740. 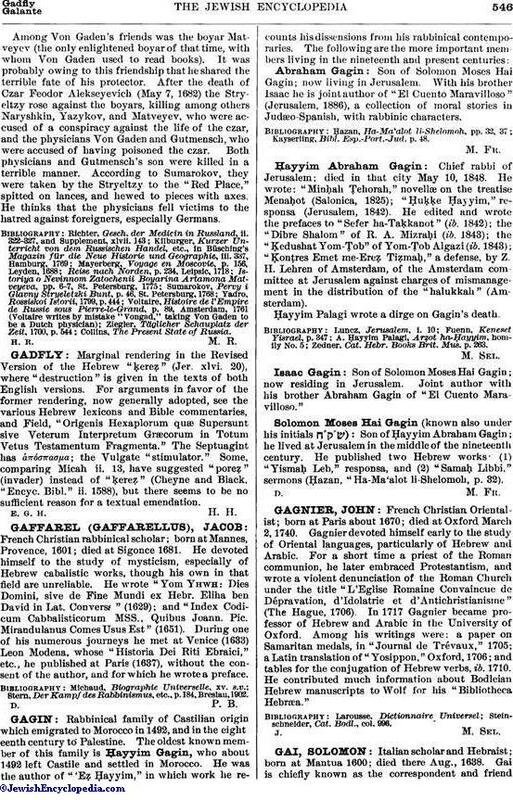 Gagnier devoted himself early to the study of Oriental languages, particularly of Hebrew and Arabic. For a short time a priest of the Roman communion, he later embraced Protestantism, and wrote a violent denunciation of the Roman Church under the title "L'Eglise Romaine Convaincue de Dépravation, d'Idolatrie et d'Antichristianisime" (The Hague, 1706). In 1717 Gagnier became professor of Hebrew and Arabic in the University of Oxford. Among his writings were: a paper on Samaritan medals, in "Journal de Trévaux," 1705; a Latin translation of "Yosippon," Oxford, 1706; and tables for the conjugation of Hebrew verbs, ib. 1710. He contributed much information about Bodleian Hebrew manuscripts to Wolf for his "Bibliotheca Hebræa." Steinschneider, Cat. Bodl., col. 996.